The dream’s details have faded. No surprise, since this dream came and went over four years ago. Even as I awakened on a morning soon after my father’s death, I struggled to recall the particulars of my nighttime sojourn with Dad. Had it lasted fleeting seconds or long moments? Did I kick against the sheets or remain still and calm as the “film in my mind” unfolded? Dreams do fade. Capricious and profound, transitory and perplexing, they are mysterious companions in our sleeping life. 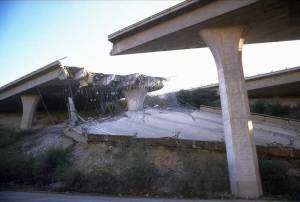 Dad and I traveled along a wrecked freeway. Had an earthquake just happened? Were bombs dropped? On we struggled, my father clearly hurt, leaning on me, and my primary focus seemed to be identifying any spot where we could safely exit the rubble of shattered concrete, buckled asphalt, and collapsed overpasses. Together we stumbled forward. I wanted to get him help. I wanted him to be safe. I wanted us off the dangerous road. I can no longer remember if I left him to seek an escape route, or if he voluntarily went his own way. When waking in the dark before dawn, and now years later, I have “interpreted” the ruined landscape as his dementia. It doesn’t surprise me that the desperate journey along the fractured pathway was remembered, while our eventual separation became fuzzy. My father’s dementia took him away from his beloved family, and certainly far, far away from himself. I was also not with Dad when he breathed his last. I had (again) traveled to my parents’ home to visit Dad in his memory care facility. I helped Mom tend to his dwindling needs, and then departed the next day. Later in the week, one of my sisters called and said he’d died. Alone. Breathing one moment, without breath the next. I have not dreamed about that grim journey again. But even as it continues to fade, I suspect I’ll never forget what the dream caused me to feel: weary and helpless. Anyone who has had a loved one with dementia will understand. In the grief support groups I’ve led, participants have mentioned dreams. Some are vivid and comforting. Some seem incomplete, but leave the dreamer confident their loved one has “gone to heaven” or is in “a better place.” Some dreams are fierce and unsettling. Some happen once, while others keep returning. I wonder about nightmares. And drugs. But I’m not referring to the metaphorical nightmare of drug addiction or delusions created by the wrong combination of medications. Those “nightmares” can be awful. I like drugs. I’m a happier guy because I’ve taken anti-inflammatory medication to reduce the pain of my arthritic knees. And right now, as I write these sentences, my doctor shifted me to another high-dosage Ibuprofen for a mild (but irksome) back injury. Rest and drugs have made a difference. Every hospice patient will likely be taking drugs. Some are necessary and will be continued. Some no longer have much value for the patient’s situation and may be discontinued. Dosages will be increased or reduced. New drugs may be introduced, especially as the medical staff helps the patient be as pain-free as possible. Many drugs have side effects (for example, constipation is one of the predictable culprits with many pain meds) and so one “good” drug is accompanied by another “good” drug to address the consequences. It’s normal not to like drugs. You don’t really want to take any! Or . . . you’d prefer to take more! A family member may have had a negative experience with a particular drug and assumes that same issue will happen to their spouse or parent in hospice. If it didn’t work for you . . . how could it work for anyone? Worries over what drugs to take and when to take them and why to take them take a lot of time with many hospice nurses as they care for patients and support the families. In a recent meeting, we discussed a new concern about one of our patients.